We are the leading manufacturer and supplier of Servo Motor. These products are manufactured using high grade raw material and advanced technology. Our offered product feature baldor controls for matched performance and are ideal for industrial applications where high torque to inertia ratio and repeatability are needed. Our clients can avail these products at affordable prices. Backed by our highly skilled and experienced professionals we are engaged in developing Rated Output Electrical Servo Motor. These SGMBH servomotor series has an internal permanent magnet (IPM) design that reduces rotor inertia. Our offered servomotors are well suited for highly dynamic, high power applications such as hydraulic system replacement. Our clients can avail these motors at reasonable prices. We are the prominent manufacturer and supplier of Rated Output Servo Motor. These motors are manufactured using high grade raw material and advanced technology. The SGMUH motors incorporate the segmented stator design that noticeably decreases the overall size. The SGMUH servomotor series features a high torque-to-inertia ratio for high cycle-rate applications. Our clients can avail these motors at reasonable prices. Reckoned as leaders in this industry, we are providing our esteemed clients with excellent quality Direct Drive Servo Motor. The offered motor has substantial load carrying bearings, low speed windings, and 1,048,576 ppr absolute encoders. The offered motor is manufactured using high grade components and contemporary technology by our skilled experts. We assure our clients that our range is quality tested on predefined parameters, in order to meet industry standards. Apart from this our prestigious clients can avail this motor, as per their needs, at highly competitive price. 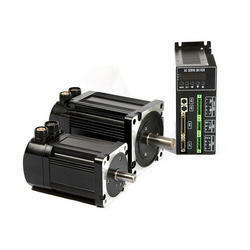 With firm commitment to quality, we supply a wide assortment of Sigma Servo Motor. It is well-suited for applications requiring optimized load matching. This motor is widely demanded by our clients for their excellent design, easy and reliable operation. The offered motor is available in various models and specifications, as per the requirements of our esteemed clients. High grade raw material is used by our professionals, along with contemporary production equipment to manufacture the entire range.